The stunning magic of the THE ILLUSIONISTS – Live From Broadway is coming to the Segerstrom Center for the Arts on Wednesday February 2. Full of hilarious magic tricks, death-defying stunts and acts of breathtaking wonder, the show takes audiences on a magical mystical trip with seven of the most incredible illusionists on earth. This high-tech, mind blowing extravaganza has shattered box office records worldwide and thrilled audiences of all ages, with its powerful mix of outrageous and astonishing acts. The seven stars, each a master in their respective fields, provide a fun, exciting and entertaining evening of escape from reality. Actor comedian and magician, Jeff Hobson, The Trickster, has been known as “the host of Las Vegas” for more than 15 years. A veteran of more than 20,000 live performance around the globe, Jeff leaves audiences laughing long after the curtain goes down. The Express in London calls him a stand-up who does magic. 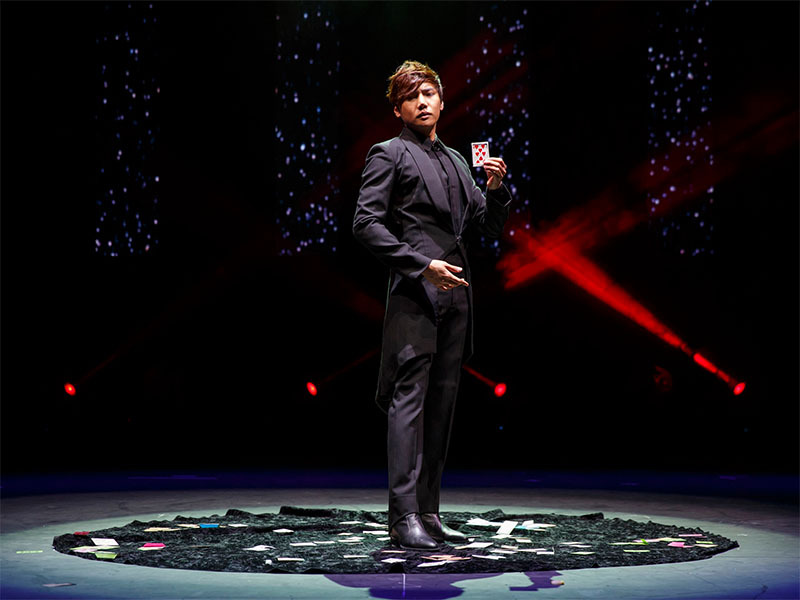 The Manipulator, Yu Ho-Jin, delivers mesmerizing sleight-of-hand card tricks with poetic grace and elegance. Recently named “magician of the Year” by the Academy of Magical Arts, The Manipulator remains silent letting the magic of his cards entrance viewers without the distraction of words. Moving from the sublime Yu Ho-Jin to the macabre, The Anti-Conjuror, Dan Sperry specializes in gruesome illusions such as swallowing razor blades and string, then regurgitating them fully threaded. Italy’s star escape artist, Andrew Basso, The Escapologist patterns his act after his hero Houdini and is the only person in the world to perform Houdini’s famous Water Torture Cell where he is locked upside down in a water tank with only a bobby pin to free himself. Another gasp worthy illusionist is The Weapon Master, Ben Blaque who performs incredibly dangerous acts of dexterity using highly powerful crossbows to shoot various objects supported by his assistant. British born James More, The Deceptionist is fast becoming one of the hottest young illusionists working today. Known for his modern approach to magic, involving fast-paced, high-risk illusions, he takes the art to new heights with a performance that promises to keep you on the edge of your seat. Kevin James, The Inventor is known for exactly what his stage name implies an innovative ground breaking approach to his art. One of the most prolific inventors of magic in the world, James has created some of the most celebrated illusions of the last century. Segerstrom Center for the Arts.